Fear and Resistance can be a Good Thing? Fear, resistance, shadow side, these energies seem to often show up together. Try as I might to be an enlightened and evolved soul, they still pop up. Why would my Higher Self attract situations that pull up these unpleasant feelings? Perhaps my Higher Self doesn’t view these feelings as “negative” or unwanted. What if from the broader perspective of my HS, these feelings were actually the juice, the fuel, for my moving forward towards something I am wanting? Hmmm, interesting perspective and one that we recently played with in the Consciousness Playground. While I was reading a post from another class member I felt a knot rise in my stomach as she described her success at using the exercise we had done in class. Then others chirped in with their success stories as well and this energy increased. Since the exercise we did in class was about observing the energy of resistance from a place of pure awareness (based on Quantum Entrainment), I recognized that this knot was the very thing that was being called forth from me to work with in a new way (duh!). Sensing myself as pure awareness I began to observe this energy, without trying to change it or shift it, just notice it, and what I saw was a very old and familiar energy. I have worked to remove this energy a number of times, calling it jealousy, envy, competitiveness, judgment, fear of success, fear of failure and those kinds of things. Yuck! This revelation surfaced much shame and guilt at seeing my shadow side to feeling oneness. I was filled with the darkness of recognizing how I unconsciously create my unique illusion of being separate. It was very uncomfortable to just sit with this nasty pressure in my solar plexus. “The guys,” a channeled group, say that uncomfortable feelings represent your known world bumping up against the unknown of where you are headed. Abraham says this discomfort is your indicator that the bigger part of you has already become what you want, and your resistance is the energy you can use to move yourself into alignment with the desired manifestation. In the CP class, Wendy used the metaphor of standing in a doorway and the resistance is the energy just before stepping through the door. Recently I listened to Anisa Aven lead a class through her “Vibration Elevation” technique and this seemed like a highly appropriate time to practice this. It is a combination of the work of Abraham, EFT (Emotional Freedom Technique) and David Hawkins’ consciousness scale. Shame, guilt, blame, regret and disappointment, all present for me in that moment, are at the very bottom of consciousness vibration. And, as you may know, how you vibrate is what you attract! I certainly don’t want more of this. Using EFT, this technique walks you up the vibration scale, bringing you to a higher vibration, as you also flip the switches on your conditioning. So, thank you to my HS who assembled all of these “cooperative components” (Abraham’s words), the right people, experiences and environments, to create this experience. I set down old baggage and moved forward into a “new” me who now senses at an even deeper level how we are all one energy and the abundance of one is the abundance of all. Today, hearing the success of others generates real excitement for them in me as if it is my own success as well. At the same time, the excitement feels very personal as I experience success through them of the future that I am lining up for myself. *On Monday, May 10 at 2 and 7pm CDT, I am leading a free teleclass, 2 Simple Practices to Feel Peaceful and Clear when Fear and Uncertainty Surround You. 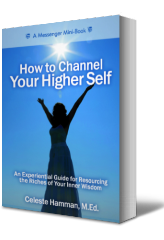 This FREE event is the kick-off to the official launch of my book, How to Channel Your Higher Self. Click here for details about the class.